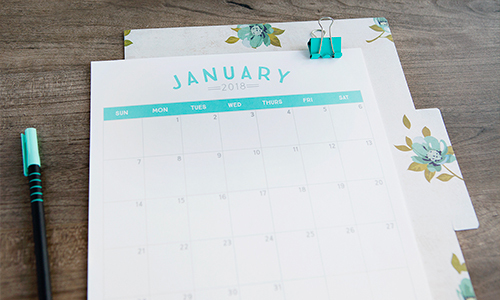 We all have those people on our gift list that can be tricky to shop for – teachers, coaches, the mailman – are a few that come to mind. 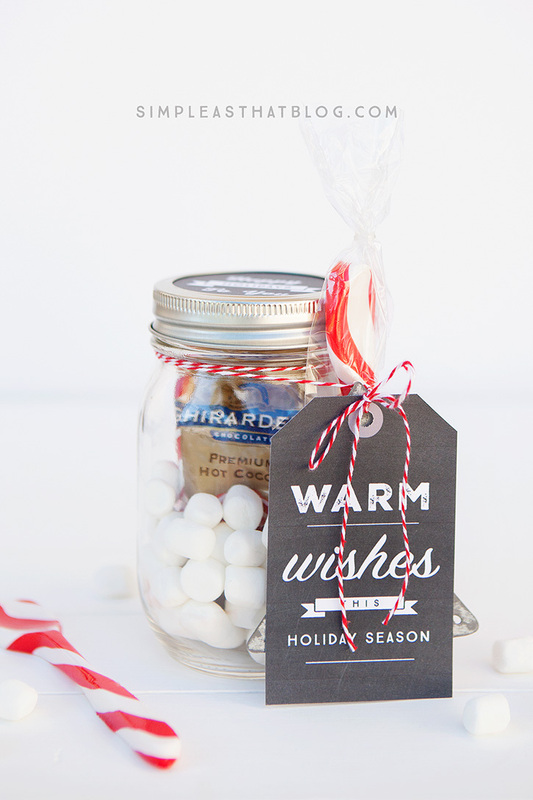 These simple mason jar gifts are just the solution! 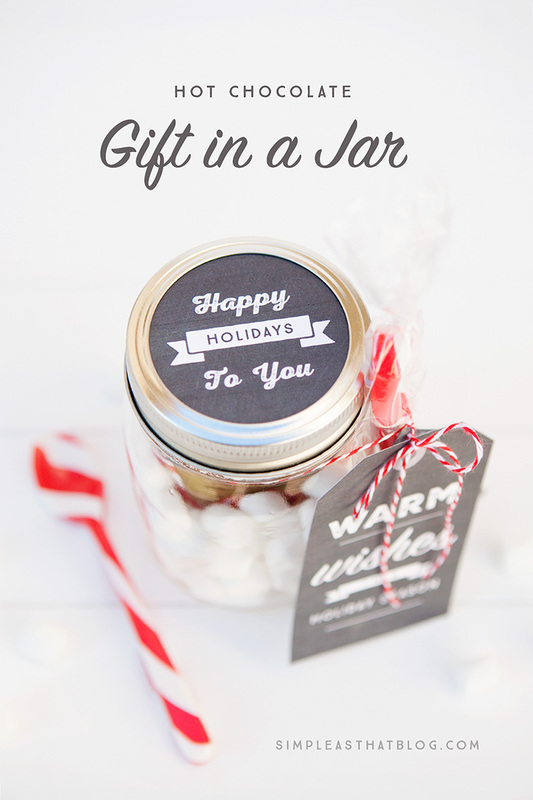 Today I’m sharing 6 mason jar gift ideas with you to help keep gift giving easy and inexpensive. 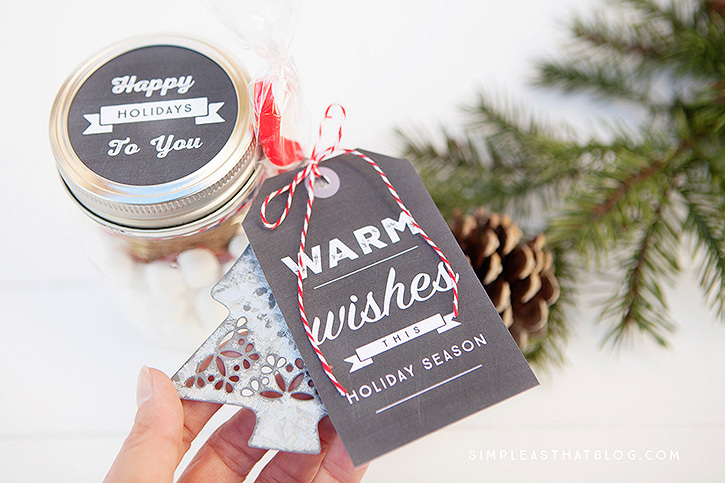 Below you’ll find everything you need to make them at home including free printable gift tags! I think you know I subscribe to the less-is-more mindset when it comes to the holidays. Whether it’s with decorating, traditions or gift giving, keeping it simple is best in my book. Gifts don’t need to be elaborate or expensive to show appreciation during the Christmas season. At Michaels they have a great selection of inexpensive glass jars or you could use recycled jars. Here’s how to remove sticky labels if you do! These pint size mason jars go on sale for just 99 cents and I love packaging little gifts in them. Here’s a list of supplies you’ll need to create the jars shown in this post. 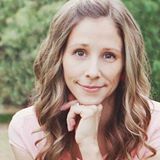 What you put in them is up to you, but I’ve got a few fun ideas for you! When making your gift list, you can’t forget the mailman! 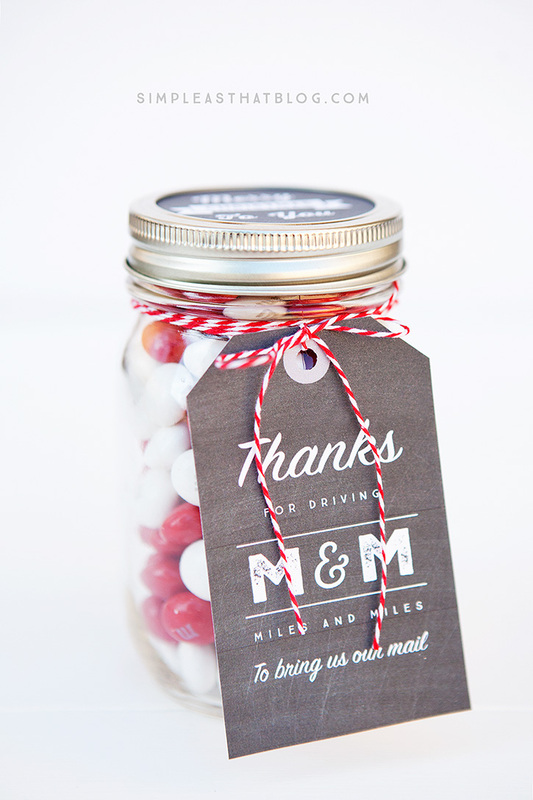 Fill a mason jar with M &M candies and gift your him or her a tasty treat to let them know how thankful you are for all those “miles and miles” they drive to deliver your mail! 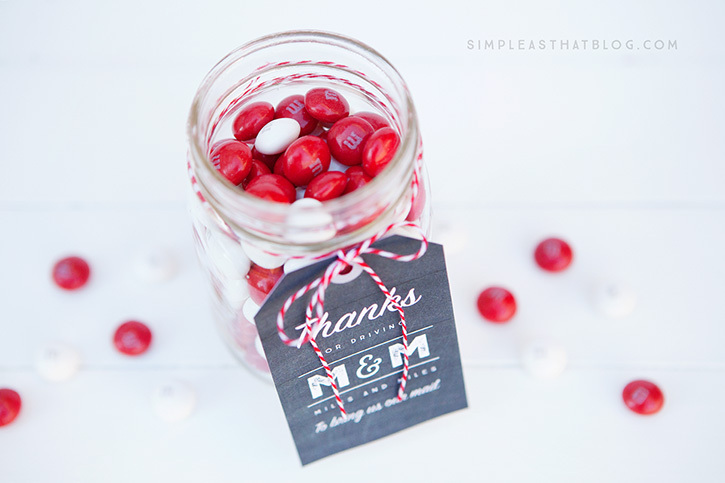 We filled our jar with these yummy white chocolate mint M&M’s but there are so many other holiday themed M&M flavors these days! Take your pick and wish your mailman a Merry Christmas! 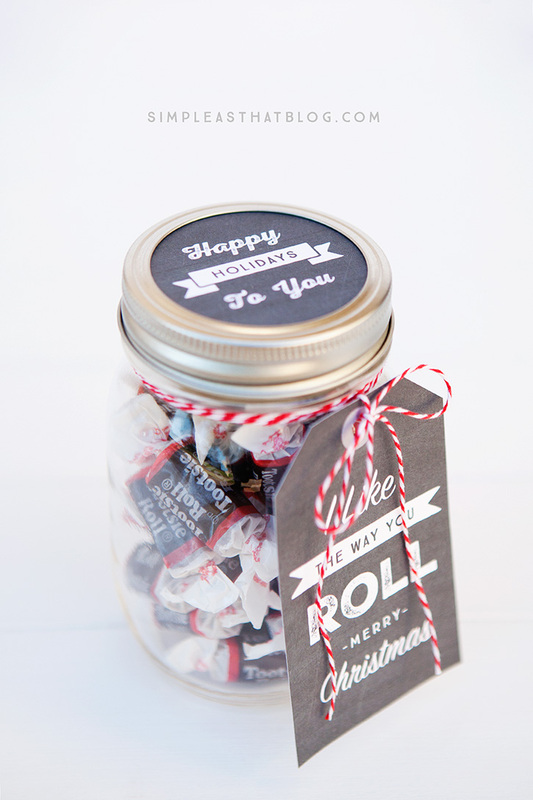 This jar of tootsie rolls would make a perfect gift for a teen or tween to hand out to friends! 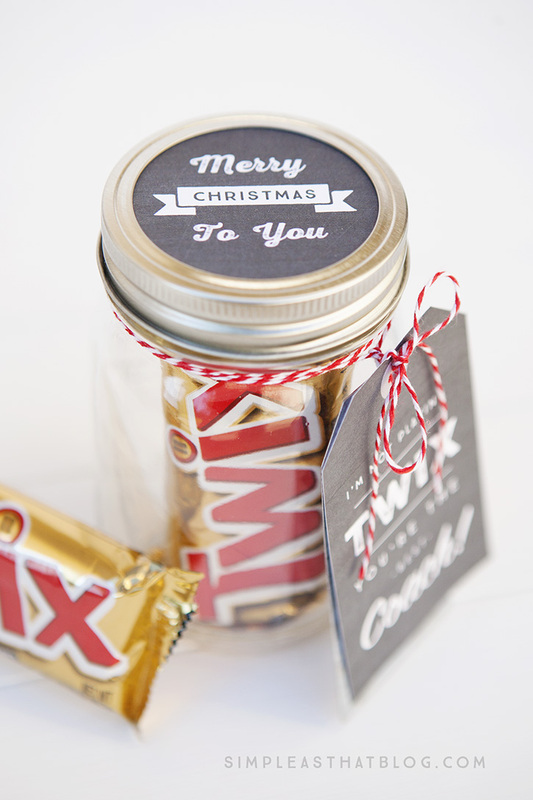 In fact, this gift jar would be great for a lot of people on the old holiday gift list. I’m thinking co-workers, friends….the bus driver! 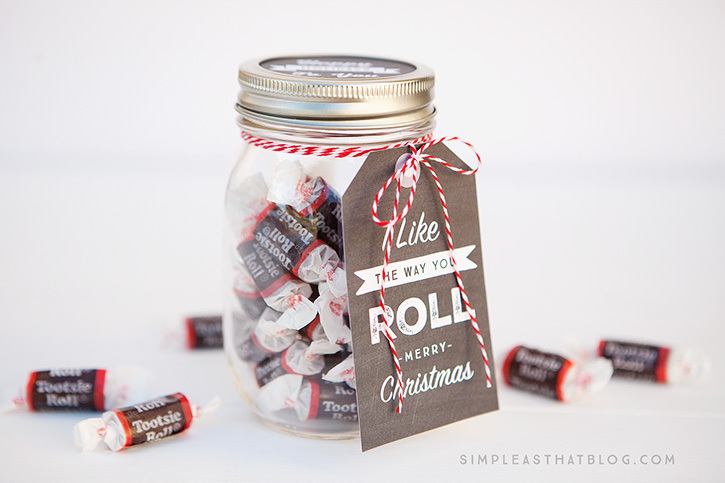 Download and print the “I like the way you ROLL” gift tags using the link below and attach to a jar filled with tootsie rolls. Easy peasy and they’re ready to gift to someone who’d appreciate a sweet treat. We’ve got a year end football party to attend this weekend and several amazing coaches my son wants to say thank you to. We’ll be taking these simple gifts to give them to express our appreciation for all they’ve done throughout the football season and to say Merry Christmas. 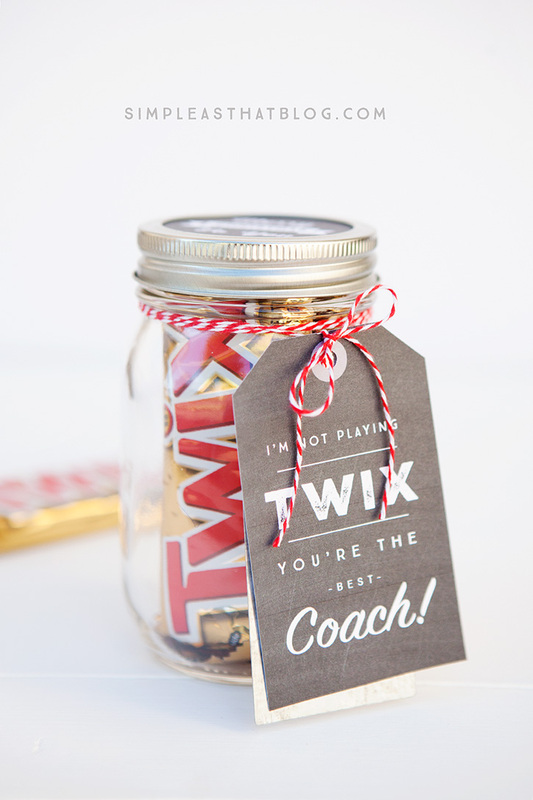 Coaches can be hard to shop for, but I don’t think you can go wrong with a jar full of twix bars! These “I’m not playing TWIX! 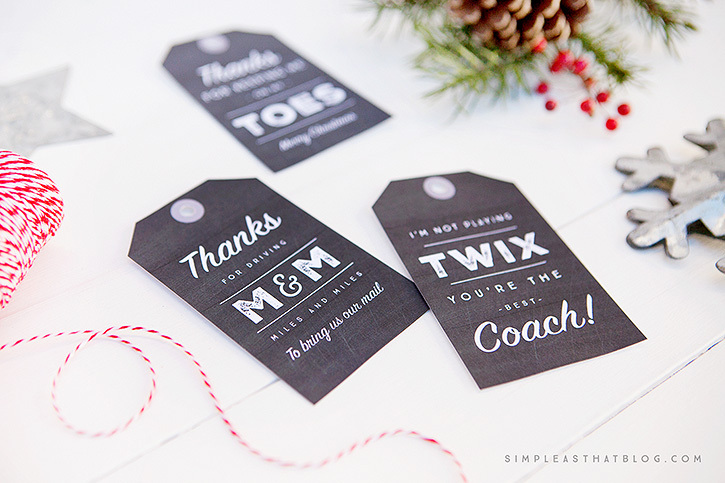 You’re the best coach!” gift tags are perfect for any coach (basketball, baseball, gymnastics, etc.) on your gift list this year. 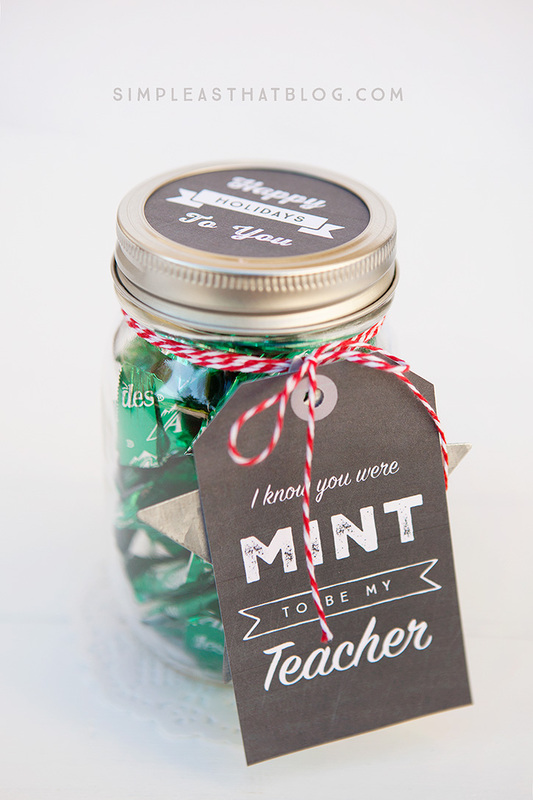 Here is another generic gift jar idea. Put a packet of hot chocolate and some marshmallows in a jar. I found these Wilton Candy Cane spoons at Michaels so I wrapped one in a pretzel wrapper and attached to the side of the jar with twine. This would make a great gift for friends, co-workers, etc. I also attached a pretty galvanized metal ornament with the gift tag to add a little something special. At the top of our gift list each year are our kids amazing teachers! 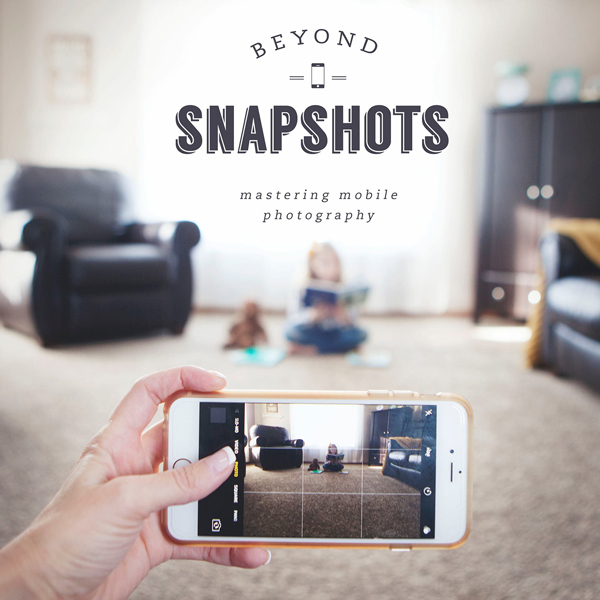 It’s always a challenge to come up with something that’s special, but affordable. With four kids, each with multiple teachers, gifts can add up. 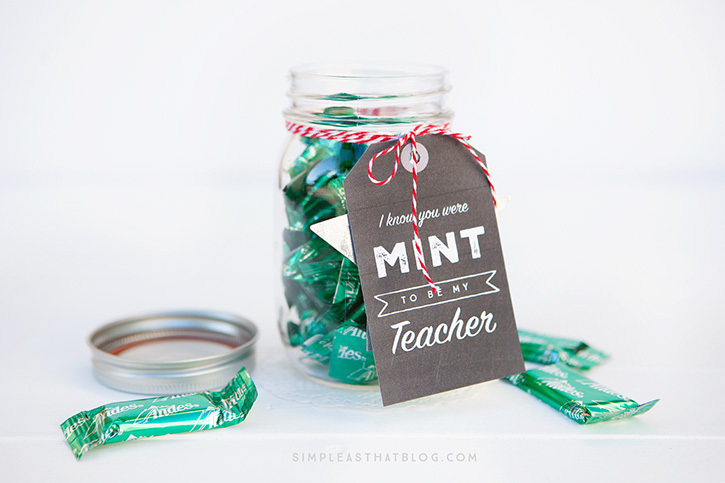 This cute little DIY gift is perfect to let your child’s teacher know that they were “MINT” to be in there class. We filled up this jar with Andes mints but you could also fill it with mint M&M’s, candy mints, mint gum or fill it with mint colored lip balm, lotion, nail polish, etc. The possibilities are endless with this one AND it can be for a male or female teacher depending what you fill the jar with! My girls are in dance and they have some wonderful instructors to get gifts for this year. 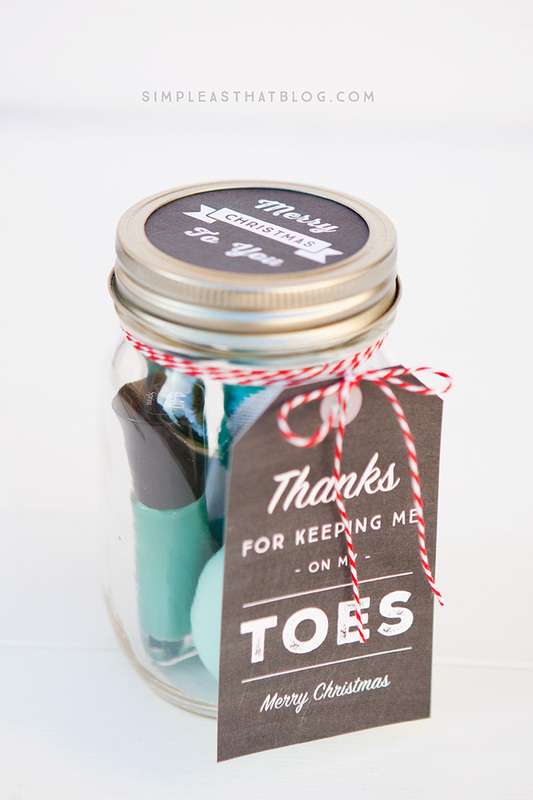 These little pampering jars include a nail file, nail clippers, a cute pair of socks and a bottle of nail polish. Michaels had all kinds of fun socks to choose from in the dollar section! For all of the jars I added a circular jar topper to finish things off. You can download and print them in Merry Christmas or Happy Holidays versions, just use the links below. 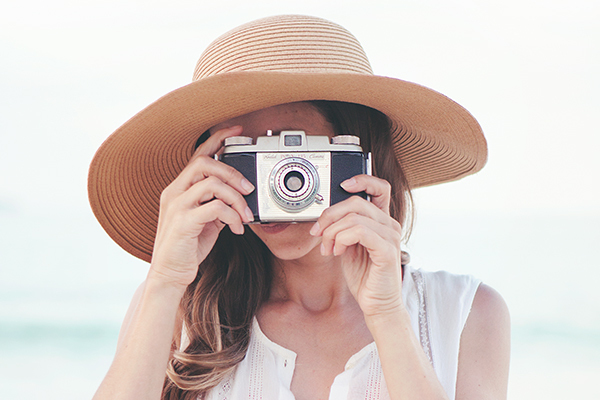 I hope these quick and easy gift ideas will help with your gift giving this year and ease some of the stress over what to get the hard-to-shop-for people on your list! 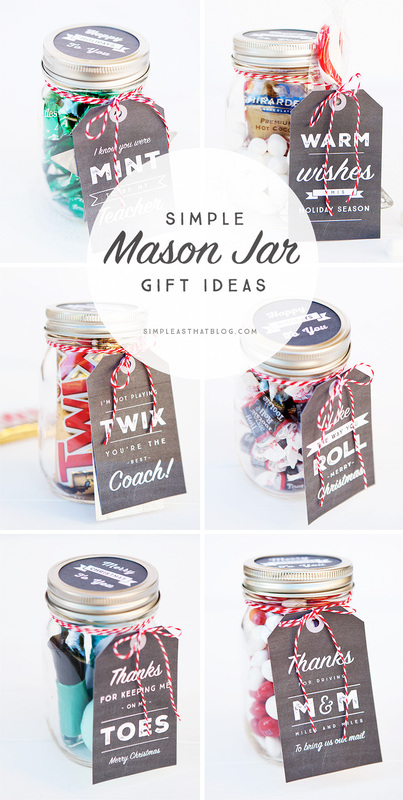 i LOVE the mason jar candy gifts!!! Thank you so much! The only problem is the top of the jars (the round top tags) aren’t working:( Just wanted to mention it in the hopes that it was an easy fix:)! What terrific labels! They sure make a simple gift so lovely and elegant! 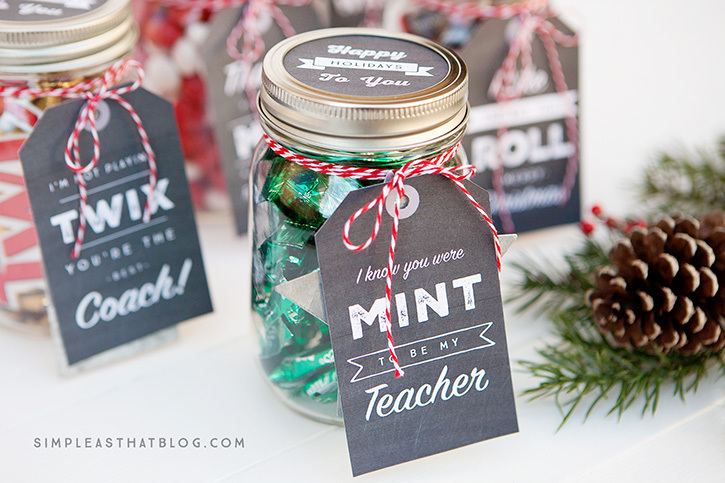 Thanks for sharing on Creative Collection Party This is so cute and will be used for all 16 of my kids school teachers. Come to think of it all of their dance and soccer coaches as well. Thanks for the Mason Jar printable tags, they are great and will make the perfect gift for my son’s teacher and our mailman. Thanks for sharing! We just used these for Teacher gifts! Thanks Rebecca. 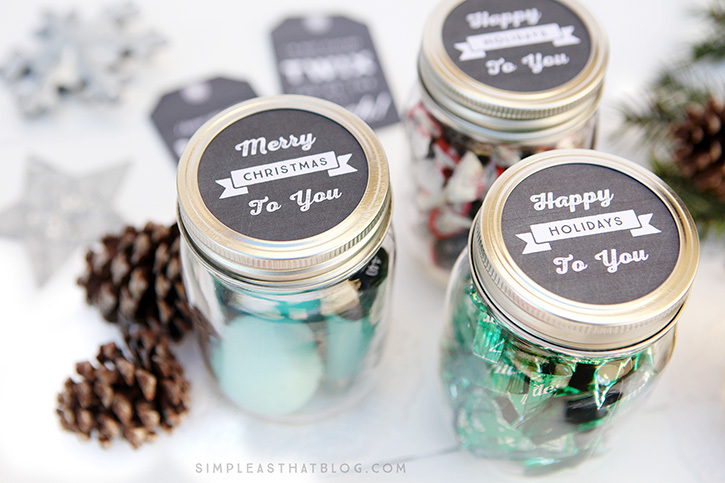 They turned out so darling with your tags and jar toppers.